With the publication of book 3 of The Courts of the Feyre: Strangeness and Charm, the series is getting an upgrade. The books will be available in larger format and will have new covers – designed by artist John Coulthart. The covers speak for themselves; beautifully detailed and incorporating symbols from the books to create stunning images. 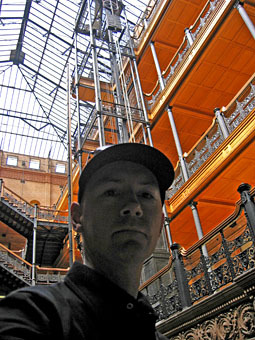 I took the opportunity to contact John, and ask him about his background and his work. Q: What made you decide to be an artist? What made you begin? Q: What motivates and inspires you? Why create? I think the earliest impetus was always “This work picture/story excites me…can I do something like it?” I’ve always had a very visual imagination so reading or listening to music would often conjure vivid images that I’d feel compelled to set down on paper. This sounds very pompous but “creativity” was a key word for me when when I was 16. If someone asked what I wanted to do with my life the answer was always about being creative rather than a specific career. This attitude was consciously vocational, I was prepared to forego everything else in order to pursue a creative goal, however self-indulgent that seemed. I knew I was good at drawing, painting and writing so it was never enough to passively enjoy what other people did in those areas, I wanted to be doing it myself. As well as drawing I was writing fiction throughout my late teens and early twenties, mostly derivative genre things. If I hadn’t got an early start as an illustrator I’d have pursued the writing more assiduously. Q: To me, your work is incredibly detailed and finely drawn. Is that a deliberate stylistic choice, a product of your technique, or something else? It’s partly choice and partly accident. The choice is that I’ve always liked very fine cross-hatching and engraved illustrations although I can’t quite say what the attraction is to the latter. It’s not so much that they’re old, it’s more the atmosphere they create, they’re obviously hand-done yet are often almost photographic in their rendering. I used to enjoy drawing minuscule details which led to using finer and finer ink pens. The accident side of things came when I was poverty-stricken but had some money to buy a rather expensive Rapidograph drawing pen. I’d no idea which to choose so I picked one with a 0.2mm nib (The finest nib they made was 0.1mm.) As a result of this, many of the drawings I did in the 1980s–including the HP Lovecraft story adaptations–were drawn with this insanely fine pen whose lines are a lot more fine than those found in wood engraving. Later on I acquired some more reasonable pens of 0.5mm and higher which I used for the Lord Horror comics. I should note I no longer draw like that, aside from it being immensely time-consuming my eyes wouldn’t stand the strain. Since I’ve taken to using a computer for illustration I’ve been able to produce collages of old engravings in a manner which harks back in part to the ink drawings but which is also inspired by the collage engraving style of Max Ernst and Wilfried Sätty. Q: Knowing how time-poor creative people tend to be, do you have time to read the works you create covers for? How do you stay true to the work? I’ll make time to read the books if I’m sent an MS. In the case of the Jeter covers I did for Angry Robot, they were reprints so I was sent copies of the novels to read before making any sketches. This isn’t always possible with smaller publishers, however, since the text is often still in preparation when they need a cover design to send to distributors. In those instances you rely on the editor (and often the author as well) to ensure you’re going in the right direction. I’ve seen enough favourite novels blighted by unsympathetic cover art to want to avoid spoiling a book. It’s obviously easier to work in advance of the text if your style is more graphic or symbolic in nature. Artists whose covers involve painting a specific scene or character need a lot more guidance to make sure they produce something that honours the story. Q: Do you have a particular process you go through for a piece? If so, can you explain how it works for you? First thing for me is always to try and find a strong central image or focus. Sometimes this may involve doing sketches but I’ve always been resistant to over-sketching. I like to surprise myself whilst the work is in progress, and I also don’t want to drain the excitement of creating something new with too much preparation. If publishers ask to see sketches beforehand I’ll happily supply them but for myself I set to work once I’ve got a rough design worked out in my head. After that it depends on the nature of the art or design. I use Photoshop for collage work or pictorial things. Sometimes Photoshop pieces are constructed by collaging many minute elements from different photos which are then blended to create a coherent picture. Other times I draw an outline on paper as a guide which I then scan and paint over using Photoshop’s brush tool. For line art and graphic things like your own covers I use Illustrator. I’ve been using the latter application more and more over the past couple of years, I like the hard-edged nature of the graphics, it’s like working in a more flexible pen-and-ink technique and I feel I’m gradually evolving my own style with it. In the case of your covers the process was fairly straightforward. Marc (the editor) had suggested using an arrangement of old graphics. I felt there needed to be a frame to contain everything but I also wanted to make it eye-catching somehow which is what led to placing a square rotated through 45 degrees in the centre of each cover. That way there’d be a strong graphic element present that would register at a distance (or shrunk down to a webpage thumbnail), whilst a closer view would deliver the smaller details. I have a large collection of copyright-free motifs and printer’s ornaments but for your covers I wanted to avoid scanning things from popular sources. I’d recently been downloading old printer’s catalogues from the Internet Archive so I used a selection of ornaments from those. In that respect the covers are quite unique. Q: Do you read for pleasure, and if so, what authors do you read? Do you have a favourite book? Yes, I read a great deal, mostly fiction but I also read a fair amount of art history. Just recently I’ve been getting back into the history of Surrealism, something I was passionate about as a teenager but which got shunted aside in a kind of “yeah, I know all that” impulse later on. I read literary fiction as well as genre work. Before Christmas I had a great time re-reading Robert Aickman’s short stories, pieces that get classed as horror but which he simply labelled “strange”. Aickman is a superb writer, many of his stories begin as quite mundane descriptions of ordinary middle-class lives which by very slow degrees turn into nightmares. It astonishes me he’s still so underrated, he really ought to be classed with MR James and Arthur Machen as one of the great British writers of weird fiction. I enjoy work like this that’s often a hybrid of some sort, I’ve never been very keen on straightforward genre material unless it’s the primary examples. So I love Bram Stoker’s Dracula but don’t really want to read any contemporary vampire things. My favourite writer when I was 11 was HG Wells, and something I enjoyed when working through his collected short stories was not knowing whether a story would be fantasy, sf, horror, comedy, or an amalgam of one or more of these. He was adept in all these areas yet never felt constrained to stay in one place. Through Wells I got on to Mike Moorcock, then through Moorcock I fell heavily for the New Worlds school of sf, especially JG Ballard and M. John Harrison. New Worlds led to Jorge Luis Borges, William Burroughs, all kinds of Modernist fiction and the wilder ends of the literary spectrum. 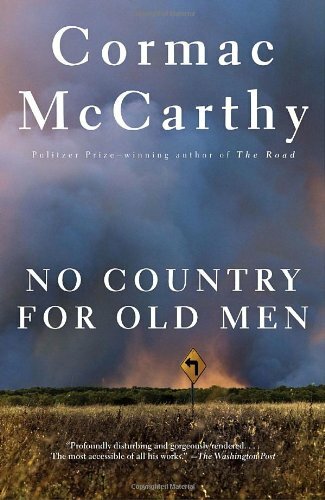 These days my favourite living writer is Cormac McCarthy. I’ve read everything he’s written, and have to stop myself re-reading the novels one after the other. I’ve always liked “opaque” writing, where the arrangement and cadence of the words is as important as what the words are saying. James Joyce is a favourite opaque writer, as is Nabokov. Joyce’s Ulysses would be my desert island book if I could only choose one, although I wouldn’t enjoy having to choose that over Blood Meridian or a selection of Borges. Q: Do you have particular works of art that are your favourites – yours or other people’s? I’m not the first person to feel embarrassed about their early work but I’m pleased with the Lovecraft book even though some of the drawing looks a little awkward now. More recently I was very pleased with the cover I did for Alan Moore’s Dodgem Logic magazine: it’s a pastiche of different styles blending Art Nouveau with psychedelic art, some imitation Roger Dean lettering for the title, and a calmly provocative central image of two butterfly boys kissing. As for other work, I’ve mentioned Surrealist art. I also like the Symbolists a great deal, the group of European artists who were precursors of the Surrealists. And Fantastic (as distinct from fantasy) art, ie: painters such as Mati Klarwein, Sibylle Ruppert, HR Giger, Leonor Fini, Ernst Fuchs, Zdzislaw Beksinski, etc. No one will be surprised to hear I enjoy Art Nouveau and all kinds of black-and-white illustration, especially the work produced by Aubrey Beardsley and Harry Clarke. When it comes to etching and engraving, Gustave Doré and Piranesi have been favourites for years, both of whom have influenced my drawing. And I should mention Tom Phillips, a British artist who’s roughly the same age as David Hockney and who I regard as the superior artist although few critics seem to agree. Q: I see you’ve drawn inspiration from and have written about ‘Weird’ fiction. What does ‘Weird’ mean for you? It’s a term that isn’t always easy to define which is one reason I like it. Fantasy, horror and science fiction evolved quite naturally as descriptive terms then ended up being co-opted by the imperatives of marketing. If you drew a Venn diagram you’d find the Weird intersecting with familiar genres, and with the wider literary world, but never quite matching any particular area. Weird Tales magazine used to publish anything that suited its title: this might be horror, sf, heroic fantasy (both CL Moore and Robert E Howard could dip into the weird stuff), and even detective fiction in the case of all those “psychic detectives”. Weird for me defines a quotient of the uncanny or the fantastical that lies beyond the usual stereotypes of the genres. It’s often present in places where there’s no overt generic reference at all: David Lynch’s Eraserhead is a good example. Q: I note that you’ve collaborated with Alan Moore – how did that come about? When I was hovering on the margins of the UK comics scene in the late 80s and early 90s I got to meet a lot of notable comic creators such as Bryan Talbot, Neil Gaiman, Melinda Gebbie, and others. I’d met Alan a couple of times before Creation Books brought us together with a suggestion that I illustrate some of the Lovecraft-related stories he’d been writing. That project fell through but we found we had a good rapport, partly because I was very familiar with all the occult stuff he was immersed in at the time. Eventually we produced another Lovecraft-inspired piece for my Haunter of the Dark book based on Lovecraft’s Great Old Ones. After that I designed some of the CDs of Alan’s readings with musician Tim Perkins. Q: What is your ambition as an artist? What would you really love to do? I’m in a curious position compared to many illustrators or designers in that a large portion of what I regard as my best work is currently inaccessible. So the main ambition is to get this work before an audience. 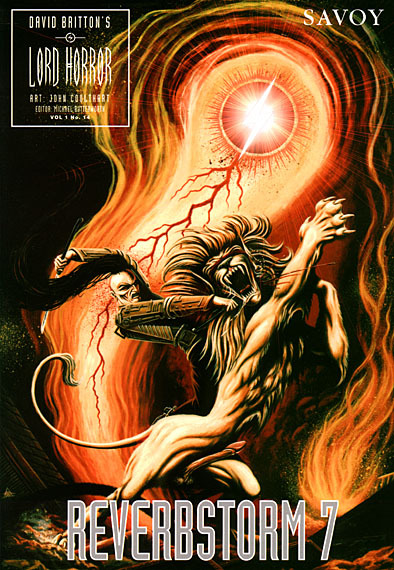 There are two more books I’d like to see in print: Reverbstorm is the first, the 300-page comic strip I produced with writer David Britton based on his Lord Horror character. This appeared in serial form throughout the 1990s and we now want to collect the separate comics into a definitive book edition. This is my major (and final) statement in the comics medium, and a quite intense and furious collection of horror and grotesquery. Then there’s my grand project, Axiom, which is a novel I was writing from 2001 to 2007 that forms the basis of an ambitious multi-media project I’d had in mind since the mid-1990s. I’d spent much of the 1980s adapting Lovecraft, and much of the 1990s collaborating with Dave Britton so I wanted to get back to my own imagination and obsessions. The idea was to create a fictional space of my own that I could explore in whatever medium I desired. I have an agent for the book but so far publishers have been resistant. We did actually get a deal last year with a small UK imprint; things went right up to the contract stage whereupon the publisher went out of business. So getting the novel published is a persistent concern at the moment. I’ve spent the past five years working on a follow-up novel that excites me a great deal since it’s a lot better than the first book. Then I have a third book planned that’ll be some hybrid of fiction, graphic design and illustration that I’ve barely begun to contemplate. If I get all that finished I may have a day off. I’ve been designed a lot of CDs lately, some for regular employers Savoy, and some for various small music labels. The latter work is mostly dubstep or avant garde electronic stuff which I’m pleased to be associated with since the music is very much to my taste. On the book side I’m roughing out a cover design for a new anthology from Tachyon. And I’ve just finished a very unusual commission for a confectionery firm based in London who asked me to design a can for a new line of “Steampunk cola”. They do novelty lines of sweets and things with sf or fantasy themes. The design has worked out well so I’m looking forward to seeing the manufactured article. There was a new experience for me this week. As part of a series of podcasts for Angry Robot Books, Dan Abnett and I were interviewed by Mur Lafferty on the subject of history, research and writing, and how two very different books can emerge from a lot of common ground. The link to the interview is here. Dan’s book, Triumff: Her Majesty’s Hero has been a recent read of mine. It’s a fun book, but as Dan expains, a lot of research went into it and I think that comes through. London as a city features very strongly in his book too, and there are some very subtle jokes in here, apart from the complete romp of a plot. Like many Angry Robot books, it’s hard to pigeon-hole but entertaining nevertheless. On Angry Robot’s Website there are also links to last month’s interview with Kaaron Warren (Slights and Walking the Tree) and Lauren Beukes (Moxyland and Zoo City), as well as an intial interview with Marc Gascoigne and Lee Harris of Angry Robot Books. Overall, a fun experience. Thanks to Mur for being such a brilliant host. It’s the busiest of busy weeks her at Shevdon Manor with, not one, but two releases. Firstly, Sixty-One Nails is now out in the United States and Canada and there have been some great comments from across the pond. Thanks to everyone for the good wishes – initial signs are very promising indeed. There’s also an interview with Falcata Times where we talk about writing, reading, archery and warm sausage rolls – oh dear, my secret’s out. Then, over on Dark Fiction Review, I’m talking about the State of the Genre and what Anne McCaffrey has to do with Buffy the Vampire Slayer and what happens when the shelves fill up with vegetarian vampires and tame werewolves – maybe not what you think. All in all, it’s turning into quite a week.